Be the first to share your favorite memory, photo or story of Grace . This memorial page is dedicated for family, friends and future generations to celebrate the life of their loved one. Friends may greet the family 3:00 - 7:00 p.m. Monday, December 3, 2018, at Our Lady of Mt. Carmel Catholic Church in Lawler where they will be a 2:30 p.m. parish scripture service. Visitation continues an hour prior to the Mass at the church on Tuesday. Grace Veronica Reicks was born November 25, 1927, on the family farm near Seneca, WI, as a daughter of William and Ida (Einck) Huinker and the Great Depression. Following her school years and her father’s death, she worked on the farm near Ossian and later in Chicago, all for her large childhood family. With Eugene Reicks, her new husband in 1949, she made a home and new family on a farm north of Lawler. Grace raised eight children and worked on the farm whenever a hand was needed (picking rock, hauling wagons, pulling pigs etc, etc.) while maintaining the house and all that goes with it. She kept the books, kept the chickens, always had a large garden and was constantly sewing clothes for her family with her beloved Pfaff sewing machine (60 years and counting). She sewed at least 100 quilts with that machine and then hand quilted many of them. 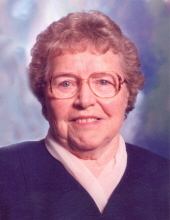 She was a devout Catholic and member of the Catholic Daughters for many years as well as teaching humility and service. Grace is survived by four sons, Allen (Judy) Reicks of Pella, IA, Duane (Penny) Reicks of Lawler, IA, Mike (Jennie) Reicks of Lawler, IA, Steve (Tammy) Reicks of Solon, IA; three daughters, Eileen (Gerald) Nelson of Eau Claire, WI, Kathleen (Randall) Van Winkle of Farmington, IA, Leeann (Mark) Reicks of Anchorage, AK; twenty six grandchildren and twenty five great-grandchildren; daughter-in-law, Sue Reicks of Decorah, IA; two brothers, William (Phyllis) Huinker of Postville, IA, Thomas (Joyce) Huinker of Festina, IA, brother-in-law, Alex Reicks of Lawler, IA; one sister, Joanne (Francis) Wenthold of Ossian, IA; sister-in-law, Edna Huinker of Decorah, IA. To send flowers or a remembrance gift to the family of Grace V. Reicks, please visit our Tribute Store. "Email Address" would like to share the life celebration of Grace V. Reicks. Click on the "link" to go to share a favorite memory or leave a condolence message for the family.